Hey guys, I have a Maximus VII Impact and I am trying to get 2600 MHz tight Dual Channel working, each stick can do it sub 1.88V The only thing I can think of would be RTLs, you are meant to use 40-41 For Dual channel right? I was using these timings and with 1.9V I instantly get a "NOT EXACT IN ROUND" Error in SPi. I just saw that pic and I don't even know what those RTL's Are. 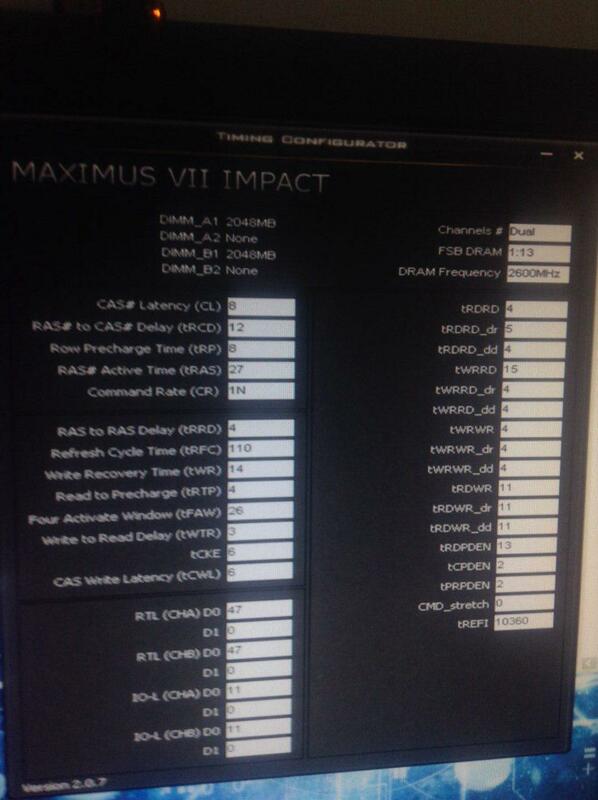 maybe try cas write latency(tcwl) at 7. 40-41 or 39-40 should do the job on impact,try from 1.8 to 1.95 ,some psc had trouble with higher volts,some need very high volts,also try 8-13-8 too or even better start from 8-13-9 to eliminate issues derivated from trcd and trp walls.